When Nelson Mandela was younger, he already knew that he wanted to help people who didn’t have freedom. After his father died, Nelson Mandela would listen to stories of his ancestor’s valour through the wars of resistance. He had hope to one day make his own contribution to freedom of his people. When Mandela moved on to University College of Fort Hare, he was suspended from school for joining a protest boycott. Mandela’s eagerness to get his voice heard originated from his father and family. Mandela had the good trait of sticking up for what is right for everyone, which sculpted him to being a strong leader. This is a picture of Nelson Mandela with his prison number around his neck. Along with being successful, Nelson Mandela faced challenges in his life. Mandela hit trouble early on after he joined the ANC, him and 150 others were charged with treason on December 5, 1956. After running for seventeen months, Mandela was arrested on August 5, 1962. He was arrested for doing acts of sabotage against the states of Southern Africa, but his goal in end was to transform South Africa into a democratic society. He did not deny his plan to commit these violent acts because he felt as though he was simply standing up for what he believed in. In court the judge said that anyone planning out a Revolution usually plans on trying to take over the government. 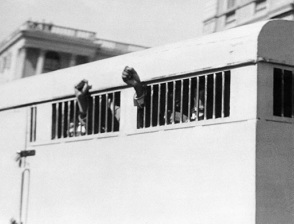 This was the beginning of Mandela’s twenty-seven year arrest. This is the main challenge Mandela faced but it doesn’t include the situations he faced with the police and opponent rioters. What kept Mandela going was that “after climbing a great hill, one only finds that there are many more hills to climb.” When he finally got out of jail, he continued to fight for justice and equality for Southern Africans. This was more difficult after he got out of jail. Nelson Mandela is the man that started a new life for African Americans in South Africa. It is uncomfortable to say that Nelson Mandela did any bad decisions or major mistakes. In all the autobiographies and bibliographies I researched, none of them include bad decisions he made throughout the journey of ending apartheid, until I saw one complainant. I later found an interview with Winnie Madikizela-Mandela by the London Evening Standard. Winnie included in the interview that Nelson Mandela let everyone down and made a bad deal for the blacks. That economically blacks are still outsiders and the government is still mostly still white. She also said that many blacks died through this struggle and are unrewarded. To say the least, I do see a small point she is making. I do agree that many people died through this journey of ending apartheid and didn’t get to see the end result. But this situation of people dying was out of Nelson Mandela’s hands. To get his point across to the government to end apartheid, Nelson Mandela had to go to more aggressive tactics when rallying. He did at first do nonviolent protests but no result was happening. For argument sake, a small change that could have been made to this “bad decision” is to use more effective protest that are nonviolent and get the point across. This is a picture of the cell Nelson Mandela lived in for 27 years when he was in prison. The prison is located in Robben Island, South Africa.